When buying fresh basil, choose evenly colored leaves that show no sign of wilting. Basil is a native of India, and it comes in more than 50 varieties. 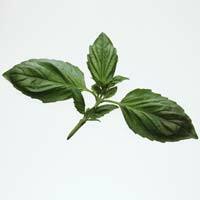 Most types of basil, such as lemon, anise, clove, and cinnamon, have green leaves. Their names are indicative of their flavors. The leaves of opal basil are purple. This variety has a stronger flavor than the other types. Its ideal to use as a garnish for salads, pastas, and eggs. Regular basil may be substituted for any of these more exotic varieties.